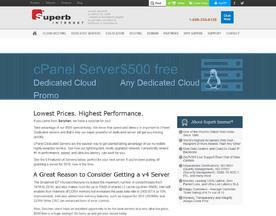 Cpanel Server is a dedicated server bundled with the popular cPanel web hosting control panel. cPanel provides a graphical interface and automation tools designed to simplify the process of hosting a web site. cPanel software gives you complete control over a vast amount of functions, streamlining useful processes such as setting up email accounts, creating databases and managing website files. cPanel works perfectly both on our Dedicated Servers and on the Superb Cloud that gives you exactly what is promised with zero overselling. We don’t just promise, we deliver 100% uptime, and over 9.7/10 average customer rating. Go with the best and save 20% for life!